The stamped wall is a plaster that can be installed in an easy and quick way for coating your house’s internal and external walls. Its application allows you to decorate your walls and surfaces in an extremely customizable way, by using specific colours and moulds for stamped plaster. The great advantage of this solution is that it’s quick-to-install and therefore it doesn’t require any demolition. 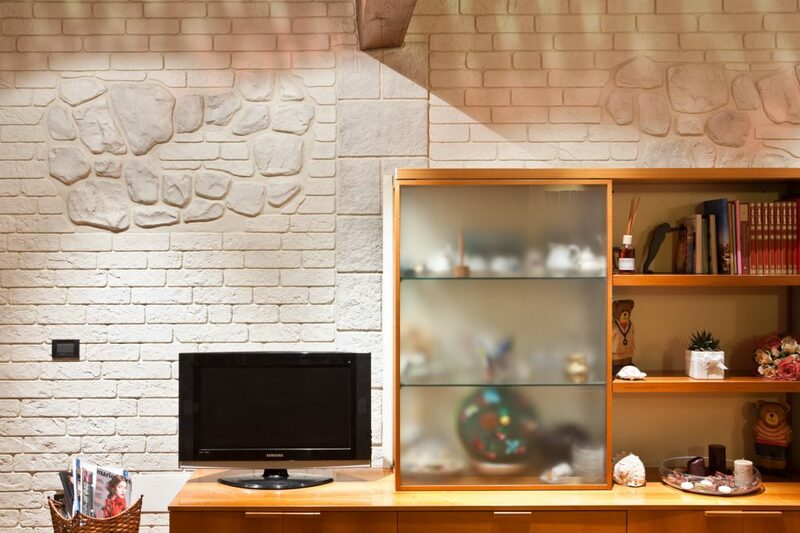 Once the plaster is applied, with the use of specific moulds for walls it is possible to obtain a classic stone-effect wall, an ancient brick wall or a wood-effect wall and many more effects. Moreover, it is possible to obtain uncountable customizations, combining colours, shapes and handcraft. We offer a wide selection of moulds and colours, but if you want to obtain a particular texture it’s possible to model the surface by hand. The Stamped Wall application is the perfect solution to create beautiful unique design walls. You can renovate your bathroom, your living room, your kitchen and your hardscape elements easily by coating any surface with the decoration you prefer. Ideal Work solutions are designed to satisfy all your needs! The stamped plaster, in fact, suits any aesthetic need. There are moulds of any kind, designed to recreate various shapes and effects, such as bricks, stones and wood in a very realistic way. Countless colour combinations are available; by mixing the standard colours it is possible to recreate the colour of natural stone and rocks, giving your wall an incredibly realistic look. If you want a particular effect or texture, the stamped wall is the perfect solution. It offers a wide range of moulds and colours, along with the possibility to be customized by hand, without the use of moulds. Ideal Work highly qualified specialized applicators, refine the plaster by hand, creating a unique design for your surfaces. Ideal Work specialists will help you choose the perfect coating for your renovation. Check out the complete catalogue! The stamped wall can be customized to obtain a unique, design environment; being applied directly on the wall surface, it doesn’t require invasive works (or partial wall demolition). It can be applied to any surface; on bricks, concrete, stones and, after an attentive evaluation of the renovation feasibility, possibly even on plasterboard, polystyrene and metal supports. It allows you to renovate your interior and your hardscape without the typical inconveniences of construction sites, such as temporary condemned areas of the building, debris, dust and annoying noise. The quickness and the low invasiveness of its installation are other two important advantages to take into account. The installation time varies according to the type of coating chosen, the existing wall conditions and the texture implementation difficulties. To give you a slightly more precise estimate, it usually takes from 2 to 3 working days to create a 20 sq wall. The invasiveness of the renovation is limited to the working site and stands out because it doesn’t involve any demolition during the preparatory phase. If built with quality materials and competence, the stamped plaster doesn’t need particular maintenance. It is advisable to clean it regularly (with cold water) and to repeat the protective treatment every few years, according to the weather conditions it is subjected to. In Paderno del Grappa there is a big Country House dating back to the 17th century. A conservative renovation has been undertaken here to preserve the building’s original look. The project has been led by the architect Sara De Ronchi in 2009. Different types of decorative concrete and coatings have been used for the renovation; the load-bearing concrete columns, in particular, have been covered with a white bricks effect stamped wall. The old wall have been covered with a stamped wall. 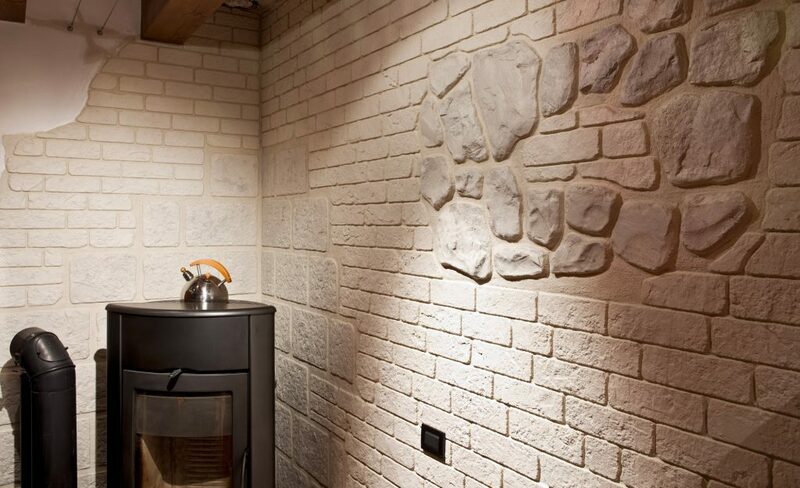 The owners of a private house in Montello decided to use the stamped wall solution to recreate an ancient brick effect for decorating the living room and a stone effect for matching the whole house’s elegant look. Given the various solutions the stamped concrete allows, it is hard to define a reliable estimate of the total restructuring price. The variables to evaluate when making the estimate are in fact a lot. You can count on our experts; they will help you find the best solution for your needs and to estimate a final price. HOW IS THE STAMPED WALL APPLIED? The application procedure of a stamped wall is extremely simple, but a perfect result requires great precision, concentration, manual skills and expertise in the field. 1 – IdealBlinder: a concentrated, high solids latex bonding agent. It serves as binding admixture for cement. 2 – IdealWall-eco: a pre-mixed mortar compound which is UV resistant and is a specific additive to improve workability, waterproofing and adhesion characteristics. 3 – Rainbow Colours: penetrating water born acrylics. These specially formulated stains absorb into the surface similar to Fresco stains and paints. Available in 10 colours. 4 – Colour pack-c: a mixture of UV-stable pigments designed to colour Ideal Wall, and other cement-based compounds. At times it is also possible to buy the materials only and to opt for a ‘DIY’ implementation. However, we always recommend to contact a specialized expert able to give you advice and assist you in the choice of a project suitable to your needs and desires. Stamped concrete has been designed for vertical surfaces, but technically it is also possible to apply it to horizontal surfaces, floors and stairs. It is important, however, to estimate the weight the stamped concrete will be subjected to and therefore the traffic that will affect the new surface. 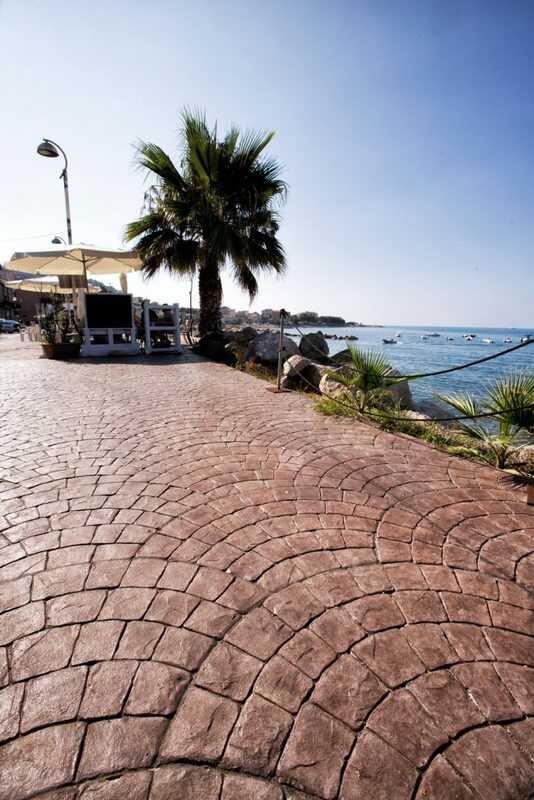 In case of coatings for stairs or floors and thus of pedestrian traffic, we recommend to use an alternative solution such as the stamped floor. Check-out the features of both these solutions!